For a Dubai stay that blends beachside chills with high-octane thrills, luxury shopping and chic stays, set your sights on Dubai Marina. This cosmopolitan destination, a 30-minute drive south of Dubai International Airport, makes an ideal base for a UAE holiday. It’s close to the Mall of the Emirates, Dubai Mall and Burj Khalifa via metro, and a short hop in a taxi to Burj Al Arab and Wild Wadi Waterpark. And, as it’s at the southern end of Dubai, it’s handy for day trips to Abu Dhabi, just over an hour’s drive away not that you’ll want to stray too far from this vibrant hub. Discover the best places to eat, drink, play and stay in this complete guide to Dubai Marina. You’d need a month to put a dent in the dining options available in Dubai Marina, but if you’re only here for a few days, start with a visit to Pier 7. This sleek, cylindrical building perched over the water is home to seven eateries, each with stylish interiors and jaw-dropping marina views. Hit up Asia Asia for sushi and dumplings, Abd el Wahab for modern Lebanese fare, Cargo for tasty Asian snacks and cocktails, The Scene for British pub grub, Mama Zonia for Amazonian favorites, Fumé for international share plates, and Atelier M for fine French cuisine. Nearby, Bistro Des Arts is a charming Parisian-style bistro that handles the classics with aplomb. The waterfront terrace is air-conditioned during summer, so you can enjoy your steak tartare and duck confit en plein air, no matter the weather. They also serve a very civilized brunch on weekends. For something a little less subdued, dress in your party threads for WeBrunch at The Intercontinental, on the opposite side of the marina. This Friday institution promises free-flowing drinks, a global buffet, and dance tunes pumping from 1 p.m. to 4:30 p.m. After brunch ends, everyone heads upstairs to The Aftermath at Marina Social Bar, where the dancing and drinking continue unabated. Just remember, it’s a serious no-no to be drunk in public in Dubai, so be sure you’re on your best behavior you venture back outside. From here, cross the road to Jumeirah Beach Residence, Dubai Marina’s clutch of sea-view apartments, restaurants and shops strung along a white-sand beach on the Arabian Gulf. Stroll along The Walk to take your pick of American barbecue at Mighty Quinn’s, al fresco pizza at Rosso in Amwaj Rotana, and Arabic café fare at Café Bateel. Between The Walk and the water lies The Beach, an alfresco shopping and dining complex that in 2019 was home to 36 eateries. Top picks include the inventive Indian dishes at Bombay Bungalow, sophisticated Emirati cuisine at Seven Sands, British classics at Pots, Pans & Boards, and bright Mediterranean flavours at Eat Greek Kouzina, plus outposts of Ladurée Patisserie, Shake Shack and Godiva. At Rixos Premium Dubai, food and beverage options span burgers and shakes at Black Tap, polished Italian at Luigia, and elegant seafood at Riviera, as well as the Azure Beach Club for daytime drinks and Inner City Zoo or Lock, Stock & Barrel for lively nights. A little further along the beach, Zero Gravity has a reputation for being one of Dubai’s premiere party spots, with its iconic clear-sided pool and day-to-night dancing. For sunset drinks that are a little more sedate, seek out one of Dubai Marina’s rooftop bars. Soak up cocktails and sea views at Pure Sky Lounge at Hilton Dubai The Walk, or for drinks overlooking the glittering lights of the marina, try Atelier M at Pier 7, Siddharta Lounge by Buddha Bar, or the party-ready Shades pool and bar at Address Dubai Marina. The fastest—and most fun—way to familiarize yourself with the area is by taking in the sights from above. Get a bird’s-eye view of Dubai Marina, the beach and the Palm Jumeirah with Skydive Dubai. Or, buckle in for the world’s longest urban zipline with XLine, reaching speeds of up to 50 mph as you cruise from Jumeirah Beach Residence to Dubai Marina Mall. Once you’re back on solid ground, shop Dubai Marina Mall’s more than 100 fashion, sporting and accessories stores or catch a movie at Reel Cinemas. Just outside the mall, wooden dhow boats and luxury catamarans depart for afternoon and evening cruises around the marina and out to sea, offering buffet meals, soft drinks, and Insta-worthy vistas of the coastline and the Palm. Party people, join the hordes at Barasti Beach: a bustling pool and beach club by day, non-stop dance party by night. For aquatic thrills, book a wakeboarding session with Sea Riders, or hire jetskis directly off the beach. Or for something a little more low-key, hire sunbeds and cabanas from Sea Breeze, ride a camel along the shoreline, or take advantage of the free yoga classes, held four mornings a week from October to April on the lawn in front of Lime Tree Café. Little ones will love running around Splash Pad, a water playground for kids aged 1 to 12. For beachside stays, check in to ultra-modern Rixos Premium Dubai, Le Royal Meridien Beach Resort & Spa (home to a wow-worthy pool, lush gardens and private beach), or the timeless elegance of The Ritz-Carlton, Dubai. Back from the beach, Address Dubai Marina offers sleek rooms and a show-stopping infinity pool perched above the marina. 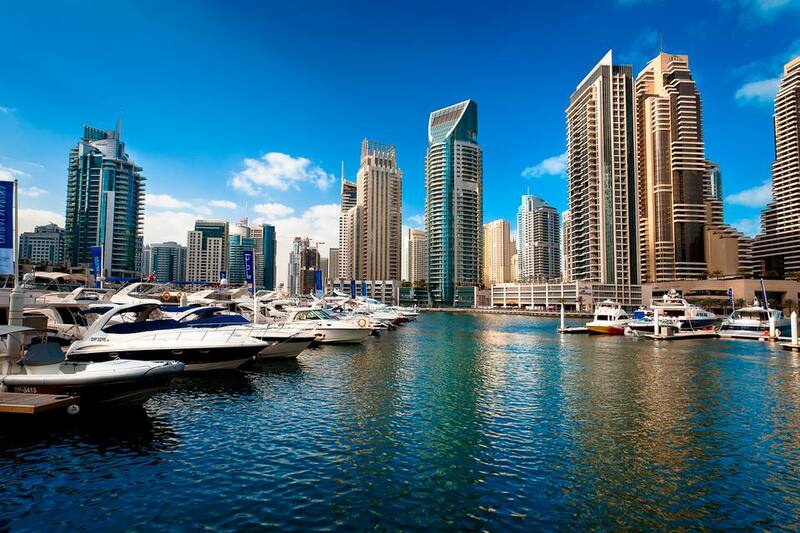 What sets Dubai Marina apart from other Dubai destinations is its accessibility. There are two metro stations (Damac and Jumeirah Lakes Towers) that take you to Downtown Dubai, Business Bay and Old Dubai; and the Dubai Tram, which travels around the Marina and Jumeirah Beach Residence, and connects with The Palm monorail. Outside the summer months (May to September), take advantage of the idyllic weather with a stroll along the four-mile promenade or a jog on the cushioned running track down at The Beach.